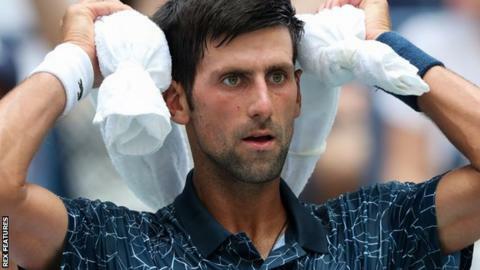 Conditions at the US Open were described as "dangerous" as five men had to retire from their first-round matches on Tuesday because of heat-related issues. Temperatures close to 38C (100F) in New York were made more stifling by humidity levels of over 50%. French player Julien Benneteau, who won on day two, said matches in the middle of the day should not have been played. "They were lucky they only had retirements," said the world number 60. The conditions led to tournament organisers implementing an extreme heat policy in men's matches for the first time. Wimbledon champion Novak Djokovic, who said he "struggled" with the heat in his win over Marton Fucsovics, added that the physical issues affecting some players were "really sad to see". Six players were forced to retire from matches on Tuesday, with the United States Tennis Association (USTA) saying five of the withdrawals - Italian qualifier Stefano Travaglia, Lithuanian Ricardas Berankis, Argentine Leonardo Mayer, Russia's Mikhail Youzhny and Serb Filip Krajinovic - were "heat-related". For Youzhny it was a sad end to his final Grand Slam tournament, with the former world number eight set to retire from tennis next month at the age of 36. The women's WTA has an extreme heat policy for its players, unlike the men's ATP, which has a discretionary rule. USTA managing director Chris Widmaier said the decision to introduce it for the men was made after consulting its medical team. The ruling offered a 10-minute break to both players after the third set and was taken if either or both wanted it. The break took place in women's matches between the second and third sets. Former world number one Djokovic and his Hungarian opponent Fucsovics were the first players to take a break after both suffered in the high temperatures. The Serb revealed that they used the time to sit in cold baths together. "Marton and I were in ice baths next to each other. We were naked in the ice baths and it was a quite wonderful feeling." "It wasn't fun to play in the heat," said Fucsovics, who lost in four sets. "I was dying after each point. It was too hot for tennis. It's dangerous." Djokovic, who asked for a sick bucket to be put next to his chair in the second set, added: "There's so much cramping going on. You don't want to see that. "You have to be fit, of course. I agree with that. But there are some conditions that are so extreme that, as fit as you are, you can't just not feel it." The USTA said it would make a decision on Wednesday, when conditions are forecast to be similar, whether to implement the heat rule for a second time. "We will be doing this on a case-by-case basis," Widmaier added. He said the show-court Arthur Ashe and Louis Armstrong Stadiums do not have air conditioning when the roofs are closed, although they may be shut overnight in an attempt to cool the courts.